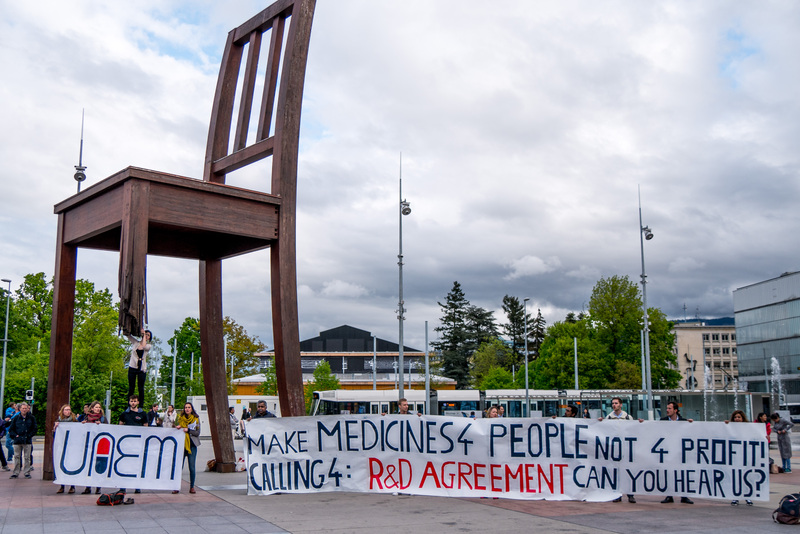 Public health advocates last week told World Health Organization delegates they must act quickly to save the lives of poor populations suffering from less common diseases for which there is no research and development funding. Nongovernmental organisations showed up to a WHO meeting on the issue to urge on delegates, even holding a public demonstration in front of the UN, but there was concern afterward at the little progress made. The Open-Ended Meeting of Member States to Assess Progress and Continue Discussions on the Remaining Issues in Relation to Monitoring, Coordination and Financing for Health Research and Development took place from 2-4 May. The first two days were open to nongovernmental groups, which offered views, followed by one day of closed governmental negotiations. The outcome report and draft decision from the meeting is available here. Sections marked yellow indicate a relative degree of agreement, according to a source, but most of the document is in brackets indicating lack of agreement so far. Hopes have been running high that governments will finally agree on alternative ways to fund R&D for medical products including medicines, diagnostics and vaccines for diseases predominantly affecting poor populations. Some of this hope stems from the UN Secretary General’s High Level Panel on access to medicines, which is working fervently to bridge “policy incoherence” on this issue and issue a report next month (IPW, Public Health, 19 March 2016). But last week’s WHO meeting showed little progress, though a number of proposals are now on the table for the 18-26 May World Health Assembly to discuss (IPW, WHO, 9 May 2016). Some were concerned about the slow progress. Numerous international and nongovernmental organisations made statements to the open-ended meeting. Below are highlights of a few received by Intellectual Property Watch. The Drugs for Neglected Diseases initiative (DNDi)’s Bernard Pécoul said there is insufficient R&D into neglected diseases, emerging infectious diseases, and antimicrobial resistance, according to notes from his remarks. Patients are unable to access new hepatitis C treatments because of price, he said. These examples illustrate how the system to drive and finance medical innovation is failing to deliver on different fronts, he said, adding that all are public health priorities and many are priorities for all countries, regardless of income level. Pécoul said this underlines the need for a comprehensive framework that ‘connects the dots’ and addresses all areas of market failure. There is no longer a clear division between diseases and countries. He described lessons learned from DNDi efforts that he said have shown alternative approaches to R&D are possible. He said it is vital to set priorities based on public health needs rather than commercial gain, and to have coordination of the multiple partners involved in R&D. He also said approaches based on the CEWG principles of open innovation, de-linkage, and affordable access allow for needs-driven, lower cost and more efficient R&D. Public leadership is needed, he said, and urged member states to support the new WHO Global Observatory and pooled fund, to request acceleration of priority-setting, and to ask for a policy framework. Médecins Sans Frontières (MSF, Doctors Without Borders), in its statement, also said it supports the fund, but that the scope needs to “’join the dots’ so that all areas of market failure are covered,” whether diseases mainly affecting developed or developing nations. This means the fund should cover emerging infectious diseases like Ebola and others in the WHO Global R&D blueprint, as well as development of new antibiotics. “The proposed fund should have a clear mandate that ensures that all calls for proposals make clear that successful applications will implement the innovation for access principles formulated in the CEWG report and summarized in WHA 66.22 – ‘affordability, effectiveness, efficiency and equity,’” it said, including ‘de-linkage of the cost of research and development from the price of health products.’ This should apply to the management of intellectual property. “We believe there is an important role for governments to take their responsibility to set priorities in R&D,” MSF said. Nevertheless, the question of whether member states are ready to decide on a fund should not limit discussions on the follow-up of the broader CEWG report recommendations, it said. Health Action International, Knowledge Ecology International (KEI) and STOPAIDS gave a joint statement during the meeting. They highlighted the CEWG’s emphasis on delinkage in 2012, said little progress has been made since then, noted the UN High-Level Panel and the need for policy coherence, and said the Global Observatory should help with transparency of markets for pharmaceuticals. The WHO should convene a meeting to consider the incentives that would induce member states to fund medical R&D as a public goods. Oxfam, in its statement, highlighted the UN High Level Panel as a unique opportunity on these issues. “We hope that the panel’s report reinstates the supremacy of the human right to health over intellectual property rights,” it said. Two areas are likely to move forwards with delinking of financing R&D from pricing of products, it said: AMR and R&D for emerging infections. Oxfam took issue with the lack of funding for WHO efforts to find alternative funding for R&D, particularly that member states have not funded the demonstration projects to which they all agreed. “We urge the CEWG to establish mechanisms for all countries to contribute an obligatory % of GDP to R&D for medical technologies as a matter of urgency as part of an overall R&D framework,” it said. The group also called for transparency, such as in the real cost of R&D, the patent status in all countries, clinical trials, free trade agreement negotiations, and pricing. UAEM noted that the CEWG recommended a global legally-binding framework to ensure sustainable funding and coordination of R&D. 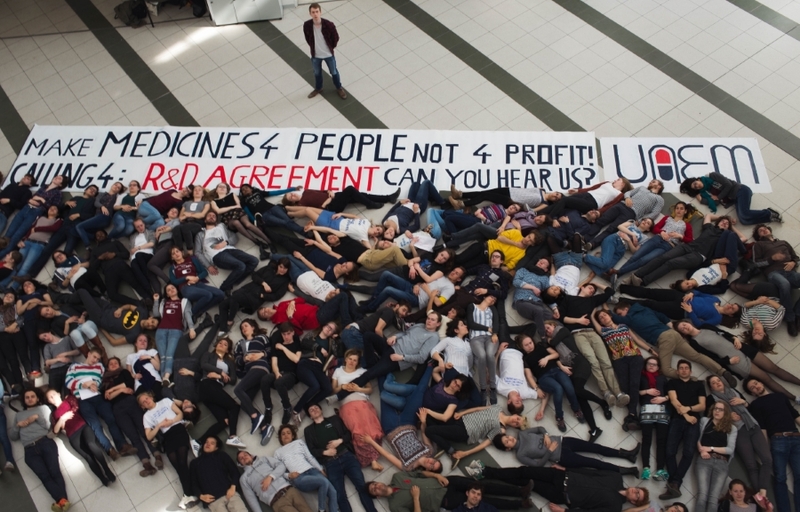 UAEM led a march from WHO to the Place des Nations in front of the UN Office in Geneva during last week’s meeting. And it said the budget gap of 88% for WHO efforts on this shows the need for mandatory contributions for a new R&D framework. "Public Health Advocates Urge WHO Action On Alternative R&D Financing" by Intellectual Property Watch is licensed under a Creative Commons Attribution-NonCommercial-ShareAlike 4.0 International License.